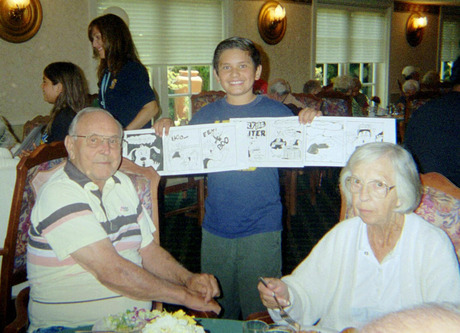 Above, an art student shares his art with his adoptive grandparents. our volunteer teachers have brought art back to the classroom. Where does the money go? More than 90% of our annual budget is invested in our programs. We focus on elementary and middle school age students, provide materials and supplies, and organize ways to recognize the children for their hard work. What kind of art do we teach? This year we're teaching Historical Cartooning. We invest about $100 per student per year for quality art classes. The return is better reading, spelling, cognitive reasoning, creativity, and imagination. Above is cartoon art instructor, Mel Schoenberger with his students in Whittier, CA. We need YOUR help to expand our programs! surf the web or shop online? Register as an AOA supporter. You can then track how much you earn for AOA! you earn ONE PENNY for our Foster Children Art Classes.